That Victory Class 2 looks great... but isn't it supposed to have three primary drives at the back over the Victory class 1's two? That's not entirely clear. I'd have to double check the next time I play it, but the Victory-I and I believe II were both first added by the game TIE Fighter as a lower poly Star Destroyer they could use for most game missions. As such, I'm pretty sure they had two originally. Over time though the Victory-II has been shown to look more and more like the Imperial class, with EaW giving it turrets and three engines, in part because it was just an adaption of their ISD model. The recent Star Wars Armada boardgames (perhaps the last thing still using the old Expanded Universe) also have their model with turrets, not sure about the engines on that one. The only real certain differences between the VSD-I and II is that the VSD-II has better engines (not necessarily a different configuration), and the VSD-I has missiles while the VSD-II has Ion Cannons. Also the old VSD model had only two engines, so at least we're keeping it consistent. I've got a question concerning systems with only an asteroid and no planet. How can I build extractors on existing mines? There is no planet to conquer, so there are no options to built orbital structures at all. Even the construction of an star base in the system did not help. You'd have to tell me what kind of planet it is. 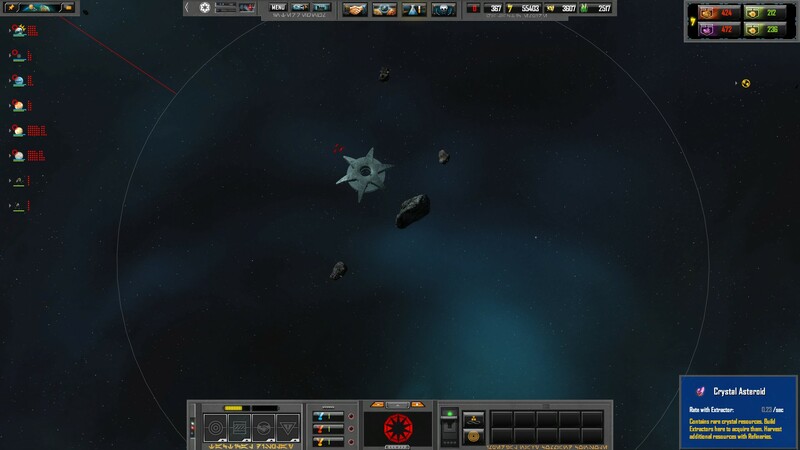 All systems with resource asteroids should be either colonizeable, allowing you to build mines, or already have neutral mining bases you can capture if the planet is not colonzieable. You can capture things with either your scout or colony frigates depending on your faction. Your scout ships can capture them. I usually turn one off auto explore and leave it in the grav well. Also, to Goafan, I'm not sure if this is a bug, but I noticed that if I leave more than one scout ship to capture a few resource asteroids or a katana fleet quickly they won't capture them all any faster because they both try to capture the same ones. This can be avoided with micro obviously but figured id mention it while I was on this topic. 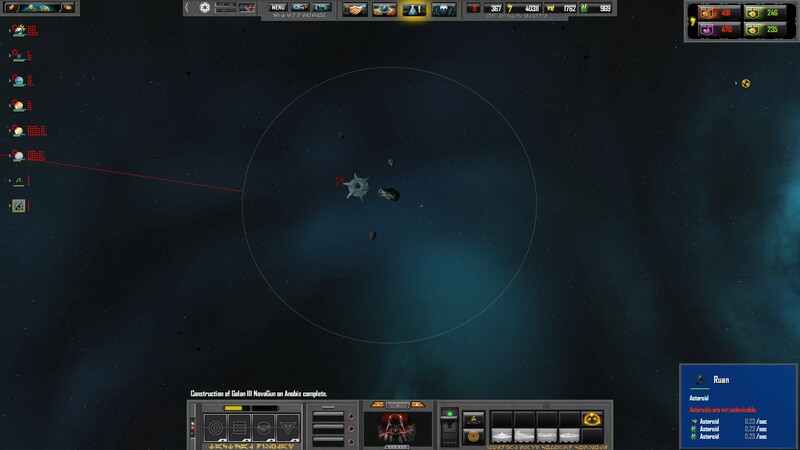 It is an asteroid system (one big, but not colonizeable asteroid in the middle). This big asteroid is surrounded by the usual small asteroids with resources (metal, crystal) but without neutral mining bases I could capture. Since I can't build my own mining bases on them, these resources are unavailable. Can you put up a screenshot? I've never heard of this before. Well there you go, chances are they are/were (if it is not canon anymore) transitioning the Victory-II to be a more clear prototype for some of the features of the ISD. But I am pretty sure it did not start out that way. Regardless, I think Max's model of it is perhaps his perhaps his best work to date, and easily the best looking Victory class ships I've seen. Even though I could agree it would be nice to have three engines to make them more different. I was kind of hoping to see the planet details, I.e. planet name and why it says you cannot colonize it. Sorry for not making that clear. Lurker dropping by to say Hi @GoaFan77 and thanks for your work. I look forward to New Republic in particular. I understand it made more sense to do the Rebel Alliance first and build from there. A bit hard to be patient but beggars can't be choosers. Personally have no significant bugs to report beyond running out of memory even on LAA. I've adjusted my visual settings lower and that did the trick. Depending on how the Mandalorians are balanced, it might be good to have a small minimod to double the raid spawn size to go with Deathmatch + Double Fleet caps. The raids tend to be brushed aside rather easily by faction fleets at those settings. It would be rather amusing if it turns out the Vasari are actually running from the Yuuzhan Vong, after accidentally getting Vong attention by opening a different intergalactic wormhole through their phase gate experiments in core of their fallen empire. It would make some sense too, since Sins factions have comparable tech effectiveness to Star Wars factions in this setting, and the Vong were initially overwhelming when they attacked. Also, I don't know if they would share their assets, but the Thrawn team will have Hapan, Duskan League, and Ssi-ruk ship models - would be interesting additions for independent system variety or random events. I'm happy with the scope of the mod as is and you've done a lot so this doesn't rise to the level of going 'oh hey Goa, could you do this too?'. Wouldn't be right to ask that. Still, one can go 'wouldn't it be cool if?' and dream a little. Thanks! Yeah, I did realize it was ironic that in terms of playstyle the New Republic might be the most popular, since they play like a lot of Sins players play. But we had to go with the Rebels first since more people actually know who they are. And since the Empire is more popular to play as, well, we didn't really have a choice but to do them last. Technically the Cartel still sends the E4X Pirate Captain hero unit on max raids. And since the Cartel ships have shields (and fighters/Corvettes for that matter), I feel they are somewhat more powerful than the vanilla pirates, even though they have other weaknesses. But yes, the Mandalorians will definitely be harder. We'll probably not up the difficulty too much by default, though the Pirate planet will have significantly stronger defenses (multiple capitalships). Depending on how the Mandalorians are balanced, it might be good to have a small minimod to double the raid spawn size to go with Deathmatch + Double Fleet caps. The raids tend to be brushed aside rather easily by faction fleets at those settings. Oh we have more ambitious ideas for that, if we have the time to implement them. As in the Mandalorians will sort of play more like normal players, including conquering any planets they manage to take, which in time will spawn more ships independently from their homeworld. The irony has been brought up here too, but I don't really want to speculate on what the chasers of the Vasari are. I feel it is best to leave that to Sins 2. I haven't paid a whole lot of attention to Ascendancy. They haven't really joined the Sins modding community that much, which is a shame, but I guess understandable since they have a big EaW mod already and they seem to have just imported their fan base from that. I've traded favors with almost all of the other Sins mods, but they haven't seemed keen to join in on that system. I will say we do have plans for minor factions and/or random events for some of those factions you mentioned. Others however may find themselves eliminated or subjugated in coming lore updates. I'll leave it to you to think about which are going to be which. Hi Goafan, been a big fan of your work since e4x. Big thanks for everything you do. I have a few questions though. How much work is left on the new republic? Is it possible to make the scout ship auto capture ai ignore a capturable that's in progress of being captured? I hope that made sense lol. Do you have plans to make maps that are themed in the universe? Could we in the community possibly make some themed maps for you? Basically all of it. Or everything that's not going to be shared with the Rebels. Which is probably half the tech tree, and more than half of the ships will be unique to the New Republic. Not easily, though there is one thing I could try now that you mention it. Actually, someone just sent me quite a few cool maps. I am going through them one by one to make tweaks for balance and a few odd cases of poor positioning, but I hope to release a map pack within the next week. At that time, I'll release a news post about how you can share maps, what I will look for if you want to make maps that will be included with the base mod, and things like that. Thanks Franky. I'm going through the mod now to see how this might have happened. Do you happen to remember what map this was, or at least if it was a random map or not? Also, were you using any other mods besides E4X/Interregnum? I've tried the mod today and yesterday. 2. I've tried working with the rebel alliance but I have run into a load of battle issues, I've been playing against empire AIs. So what's going wrong here? My battle plans or are the Rebels just weak? The first is that I doubt the power of the abilities of all capital ships. I use them as well as I can, I've used them in all sorts of combinations and I feel that there is no bonus whatsoever. My fighters aren't any more powerful, die faster than the imperial fighters, even though they're the ones outnumberd by mine and the enemy ships die slower than my ships, even though I'm very sure I've got more firepower than they have. Secondly, what imperial ship's presence forces my ships to a phase jump charge rate of 700%? I couldn't work out what else causes it. This also brings me to the third part. Why do the carriers have weapons? They immediately went to attack a planet while I wanted to keep my distance and deal with the starbase first. While it's possible to do so, a single moment of dealing with a battle three planets away got them all killed because they went at it. While the dual role seems nice, it actually only adds tedious micro-management, which you already have enough of if you want the fighters and bombers to do a decent job. If they're really supposed to keep the bombing systems, it would be great to have it an ability with autocast disabled by default. Still micromanagement, but missing it due to whatever reason there is, will make it far less of a tactical liability. Finally, the carriers have a cost of 21 and can only come up with 2 squardons? Is this because of the starfighter doctrine later on or because of the multiple roles they have? I'm not really sure if I already had the starfighter doctrine available (have to look again next time), but if I have, will I see it in the form of being able to deploy 4 starfighters from a carrier instead of 2, or will it still be 2 with a copy for each of them automatically. If necessary try lowering you graphics (ship/structure/planet) detail as well, even if you're sure you have LAA. A few people reported having stability issues with LAA and that reducing graphics settings still helped. Perhaps for whatever reason LAA does not work properly on all PCs; sadly I have little way of knowing. Alliance MC80 capitalships do different things, but all have abilities that either improve defense or provide healing. Combine this with further healing benefits from the Nebulon-B Frigate and Bulk Cruiser, as well as their durable late tier units like the Assault Frigate and MC40a, and Rebel fleets can be very difficult to kill. Just like the Battle of Endor, the main Rebel Fleet is intended to outlast its opponents while its fighters do major damage. Per fleet supply your fighters are definitely a bit more powerful. They become easily the best fighters in the game when you get the Starfighter Doctrine research, since this gives an extra fighter to all squads, I.e. a +25-33% increase in the total HP and damage of each squad. The Imperials have more units that can deploy small groups of basic TIE Fighters but their units are also much more expensive. Any of the Interdictor Cruiser units. I had to program Interdictor cruisers to work differently for the AI since they could not handle the complexity of using them properly. So they act as moving phase jump inhibitors for the AI. For human players they stop all hyperspace jumps, but only while they have antimatter, and they can be interrupted or will be forced to stop if they take enough damage. There is not a whole lot of units that can disable Starbase abilities. However very powerful units, like the hero unit Grand Admiral Thrawn or Darth Vader (a titan) do have abilities that can accomplish this, as can your own Liberty Mon Calamari cruisers. None of these units can keep up abilities disabled by themselves though, so unless there were several different units capable of doing it, you should have had some window to use the ability. It just unfortunately wasn't when you needed to use it. Rebel QuasarFire carriers do not have weapons. However, they do bomb planets with their Y-wing squadrons. All Rebel units bombard the planet with Y-wings because they are typically against the massive turbolaser orbital bombardment so often used by the Empire. The Alliance is also all about dual role units, like their light Frigate, the CR90 being a minelayer and the Galofree transport acting as a special constructor for deep space stations and planetary Ion Cannons. If you are attacking a heavily fortified system I set all my units to local engagement range, that should help keep them out of trouble. All standard carrier cruisers in this mod cost 21 fleet supply. This was a change from Enhanced 4X that tried to reduce the number of fighters (and thus lag) by increasing carrier costs and fighter stats by 50% over Vanilla Sins. Capitalships also had the number of fighters they can carry reduce to account for the stronger fighters. Sadly the infocard for Starfighter Doctrine is a bit misleading. It actually increases the number of fighters in each squad by 1. For some reason the infocard is treating it as a percent, as 1 = 100%, probably because this modifier was never actually used in the Vanilla game. 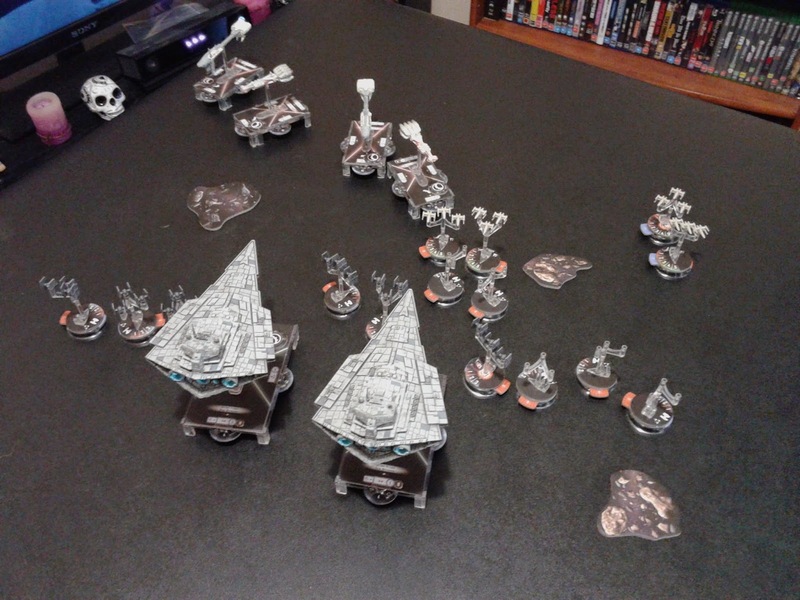 This is still very good for the Rebels though, since they have the smallest squads in the game. So X-Wing, B-wings and Y-wings get a 33% boost from this tech since they go from 3 to 4 fighters, while A-wings go from 4 to 5 for a 25% increase. It was a random map, more precisely "Random Tiny Competitive". I use no other mods. Thanks for the awesome mod! Thanks for all the explanations, it really helped (from a devastating military loss to a flawless victory with just a few changes in my fleet, those Nubelon-B ships are very useful). Also, I had already changed all details to the lowest possible and now it works very well. Maybe I'll try increasing some things later but the graphics don't matter that much. Quick question - is the Rebel insurrection center considered to be its tactical super weapon, for the purposes of the no super weapon minimod? In terms of feedback, the one thing I believe I can reasonably testify to is that it seems like the Rebel's mechanics don't hold up well when fleet caps have been maximized (large fleet + deathmatch + double fleet). 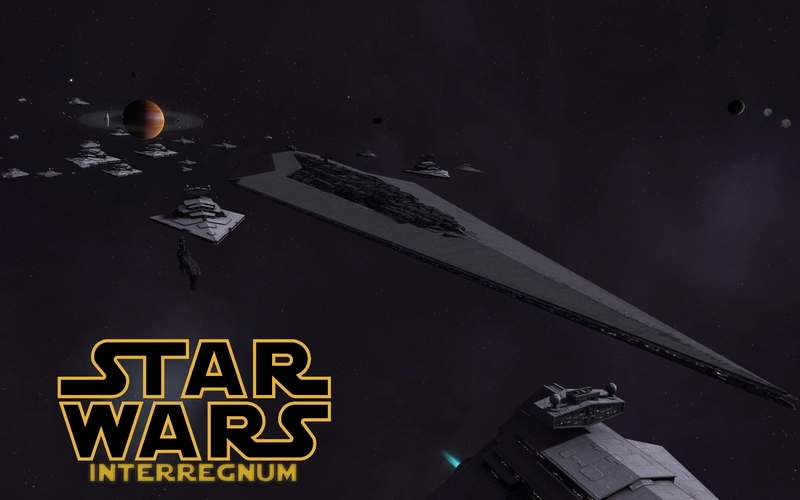 In particular, Imperials bring enough antifighter support to negate Rebel carriers, and so many interdictors that you usually can't clear them out to remove all the jump inhibitors before the encounter has been decided - whereas the Sins factions and other hostile Imperials feel relatively more suited to slugging it out directly with combat ships. Despite having a #1 map rating on research with 3/4 of the combat upgrades done, I've experienced that large Rebel fleets based on combined arms just don't seem be very effective when they try to stand their ground in mass fleet engagements, again, especially against Imperials. Liberty capships do their best to taunt and tank but they tend to pop one by one even with repair support. I can't tell at this point if I'm playing the Rebels wrong or if its a result of the large fleets running about on the high fleet cap settings, but my experience so far tends to lead me towards the concept that Rebels are meant to scatter, harass, and hide until they've basically capped out all their research upgrades - only then can they seriously build a fleet and attempt an offensive. If that is how its supposed to be, it is rather thematically appropriate, but the viability of the faction becomes very sensitive to the chosen map layout. They don't seem to thrive on maps that are designed around defensive bastions or bottlenecks that force fleet encounters - instead they feel most suited to relatively open large maps where they can perform hit and run tactics while scattering colonies everywhere. Yes, the Insurrection Center is the Alliance Superweapon. You don't see your typical superweapon blast because it triggers instantly, but it counts as a Superweapon for the Superweapon build limit and sets off the Superweapon activated alarm. So yes, the No Superweapon minimod will get rid of it. In terms of feedback, the one thing I believe I can reasonably testify to is that it seems like the Rebel's mechanics don't hold up well when fleet caps have been maximized (large fleet + deathmatch + double fleet). I do not explicitly balance the mod with minimods in mind; they are just optional tweaks for players that feel the game would be better if it was faster/had larger fleets etc. Occasionally I fix the biggest exploits with the Expanded Research minimod (I.e. if it allowed factions to get 100% Shield mitigation as the Advent did, or free upgrades), but that's basically it. There is no way to make the mod balanced by itself and with every combination of the minimods. A few people have brought up similar concerns. I will say especially early on the Rebels aren't supposed to hold up that well in a straight fight, but they should tank extremely well late game with their end game units. It is typically harder to get a faction to play right thematically; if it turns out they are two heavily penalized in straight fights, that can be adjusted easily enough with some stat changes or maybe an extra ability or two. It usually takes a few releases for the balance to get right. One thing about Interdictors though, the Rebels do have a counter for them. Your second hero units, Kre'fey, has a passive ultimate ability that makes units near him immune to jump prevention/delay effects. So Interdictors and Phase Jump Inhibitors won't work on any ships around him after you get that ability. Both the Rebels and Empire have counters to each other's strong points, or since Interdictors are a counter to the Rebel's mobility, perhaps we can say Kre'fey is a counter to the counter. I may just fire up Sins and try this mod out. Thx Goafan77 for keeping this game alive. I just might be pushed into making some more changes to DS. Oh I intend to be here in some form until we get Sins 2, or whatever the future holds. Please let me know what you think of it. Re: Insurrection Center, thanks for the clarification. No problem about how Rebels handle with the minimods - that was intended more as an observation than an actual complaint. Again, I'm still not sure I'm actually playing them correctly. A few people have brought up similar concerns. I will say especially early on the Rebels aren't supposed to hold up that well in a straight fight, but they should tank extremely well late game with their late game units. It is typically harder to get a faction to play right thematically; if it turns out they are two heavily penalized in straight fights, that can be adjusted easily enough with some stat changes or maybe an extra ability or two. It usually takes a few releases for the balance to get right. Well, possible tweaks aside it is successful in being thematically different from the other factions in how it handles, and that theme is in the tone I would expect for the Rebels. Oh.... I didn't know that. Makes it somewhat ironic he died early in more than one engagement. Kre'fey, you are now fleet #2, hold position, just sit tight in the back with your fancy "nope we want to leave" aura plzkthx.